Brutal winter storms in much of the country didn’t stop home sellers from being optimistic about the housing market, with 10 percent more properties for sale nationwide in February compared to a year ago, according to data released today by realtor.com. The median list price increased 7.6 percent to $199,000 during the same time, according to the National Housing Trend Report. Along with more homes being put up for sale at higher prices, the median age of the inventory went up 6.5 percent from a year ago to a median of 114 days, or almost four months. Homes being on the market longer can help turn what’s now considered a strong seller’s market into a better situation for buyers. “We’re still seeing a stronger sellers’ market. 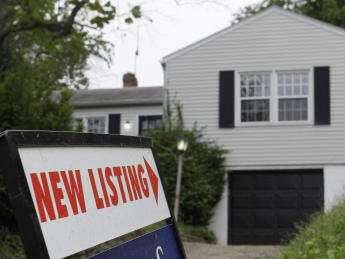 We’re slowly, hopefully moving more toward equilibrium,” says Steve Berkowitz, CEO of Move, Inc., operator of realtor.com, the official website of the National Association of Realtors. This good news doesn’t necessarily mean that the normally busy spring buying season is starting earlier, but it could open the door to more spring sales. Sellers are showing that they’re more confident than they were a year ago and are willing to put up homes for sale that they might have previously held back on because they had little or no equity in them, Berkowitz says. “It could be a sign that more housing is coming on the market,” he says. Why more listings? Home sellers could be putting their homes on the market well before the spring buying season because they think they’ll beat the competition and get the price they want now. “With the inventory you may get a better price,” Berkowitz says. “Life events” associated with housing changes — such as births, children entering school, and aging homeowners downsizing — are again causing homeowners to move because they can afford to if they have more equity in their homes as home prices increase. Low interest rates for home loans can also be a reason for more home listings. The 7.6 percent increase in home price listings is another sign of seller confidence going into the selling season. However, of the 121 markets that posted annual gains in median list price in February, 84 markets rose less than 10 percent, according to the report.